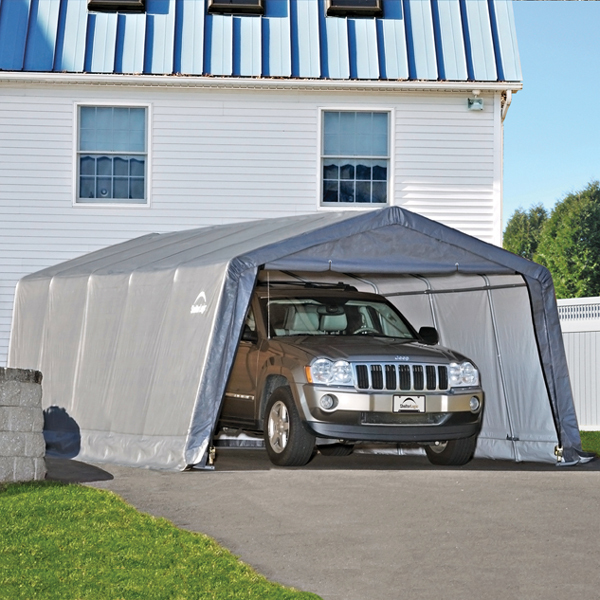 When you get a Garage In A Box Peak-Style Portable Storage Shelter, you have something that comes with everything you need for a quick and easy set up. Without the hassles of a permit, you can open the box and have a large sturdy structure anywhere and any time you want. 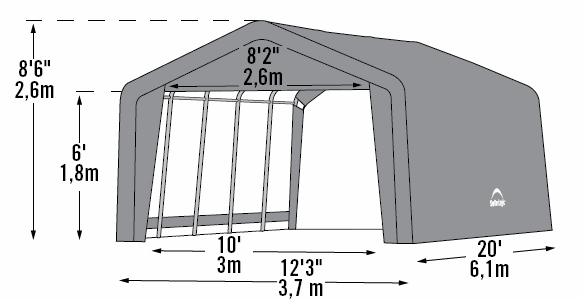 This garage measures 12 feet W x 20 feet L x 8 feet H. The frame is heavy duty tubular 1 3/8 inch in diameter. What fabric thickness does this have? This is a 9 oz. cover. The door is 6 foot high and the width at the bottom is 10 feet, tapering to 8 feet-2inches at the top. What kind of guarantee does this product have? It has a one year manufacturer's warranty against manufacturing defects. This does not cover weather related damage or damage cause by improper use or improper anchoring. How tall is the opening of this shelter? The height of the opening on this shelter is 6 feet.